Food importer and distributor Everything Fresh Limited plans to approach the stock market for equity capital to expand, saying a vibrant tourism market has driven up demand for its products. The company plans to invest in warehousing and storage as it contemplates a potential rise in business, t is holding projections close to the vest to avoid breaching regulatory rules. Managing Director Courtney Pullen says he is not looking to add a lot of square footage at the plant, based at Marcus Garvey Drive in Kingston, because his business model is built on the delivery of fresh produce and quick turnaround of inventory. “My concept is quick in, quick out. 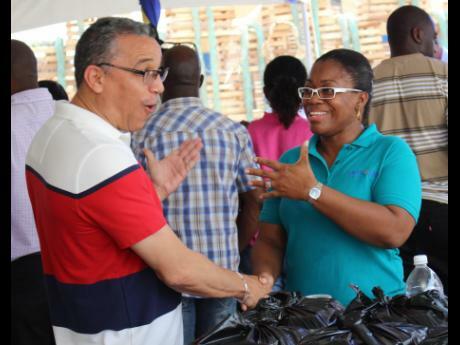 My meats come in every single month, my produce come in every week, my delicate dairy comes in every two weeks in and out; quick turn,” he told the Financial Gleaner. “It’s not so much expansion plans for us, but rather that the market is expanding rapidly. And the question is, can we keep up with that expansion,” he said. Company chairman Gregory Pullen declined to comment on the current size of the operation, but said Everything Fresh has been delivering solid year-on-year growth for some time. “We have grown every single year since we commenced operation,” the chairman said. “We’re always making improvements to the plant. Nothing about the plant is static, has ever been static, or will ever be static, which is why we’re considering going public,” he said. Gregory and Courtney are brothers. Courtney Pullen started operations in 1996 as a sole trader, selling local farm produce to supermarkets. After three years, Pullen segued into fruits and vegetables from the United States, imported through a Jamaican middleman. As that side of the business grew, he created C.L. Pullen Limited in March 2003 and began importing his own goods. Five months later, Pullen renamed the company as Everything Fresh Limited. Citing competitive reasons, the MD was non-committal about the company’s position in the market, saying only they were “a small company with a leading edge in a few products”. Pullen says the business will continue operating from Marcus Garvey Drive, but he hopes to acquire additional premises, to be financed from the initial public offering (IPO) of shares. “You have to expand the warehouse after a while, and I see us getting a bigger place for storage, but I don’t believe in these super-huge warehouses where you store goods forever,” he said. “I know the storage footprint might go from one or two months, and maybe three, but certainly not as much as a year. Those days are over,” Pullen declared. In preparation for the IPO, which Pullen said was in the final stages of planning, the company has assembled a nine-member board chaired by Gregory, with other directors being Courtney and his wife Melene Pullen, Garret Gardener, Nesha Carby, financier Mark Croskery, ex-banker Donovan Perkins, attorney-at-law Vivette Miller and Jennifer Lewis. Pullen says the make-up of the board is such that it draws on a range of talents from several sectors.